Kim Hill was born and raised in rural New England. She began studying with Sidney F. Willis, a Boston School artist, at age 16. This experience set in stone her desire to pursue and develop her lifetime love of painting. Her formal education includes study at the Paier College of Art (Hamden, CT.), and the American Academy of Art (Chicago, IL.). Kim is equally gifted in working with oil, pastel, acrylic and graphite. She currently holds membership in the Oil Painters of America, American Women Artists, and signature membership in Pastel Society of the Southwest. Her work is shown at the Dutch Art Gallery, Dallas, TX, the R.S. Hanna Gallery, Fredericksburg, TX, Gold Leaf Gallery, Tyler, TX. and Bennington Center for the Arts, Bennington, VT.
2011 ~ Salon International, Greenhouse Gallery – Honorable Mention for Artistic Excellence and Jury’s Top 50 award. 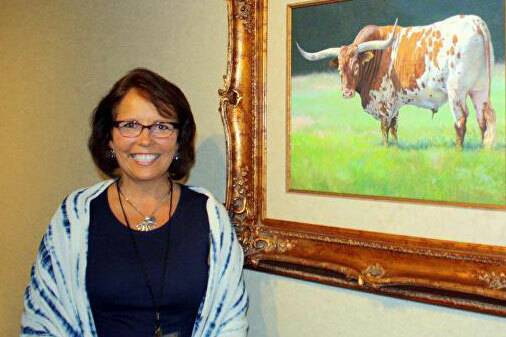 Her work is also part of the permanent collection of the Bosque County Conservatory, Clifton, TX, and the Richardson Public Library, Richardson, TX. In February, 2014, Kim was asked to judge the Bold Brush Competition. The focus of Kim’s life is to create powerful, striking paintings which invoke a yearning for the best of what God’s creation offers.